Trees help our soil remain healthy by reducing soil erosion and by creating a soil climate suitable for microorganism to grow. Evergreen trees are green year round because they do not lose all of their leaves in one season. Most will however lose some of their oldest leaves just before they produce new leaves in the spring. Some will lose part of their leaves in the fall. Tree leaves are composed of many colored pigments -- green chlorophyll hides them during the spring and summer growing seasons. Shorter days and cool temperatures in the fall cause the chlorophyll to break down and the other pigments to be see. Every state has an official State Tree. We do not have a national tree, however, there is a campaign to have the oak adopted as our National Tree. Arbor Day, a day site aside to plant and recognize the importance of trees, is not a national holiday. If fact the day observed varies from state to state. Tree wood is a highly organized arrangement of living, dying, and dead cells. The beginning and growth of tall woody trees in forests may have played a key role in the extinction of the dinosaurs. Hundreds of food products (fruit, coffee, nuts, etc.) and food additives (for ice cream, chewing gum, etc.) come from trees. Each year, one person uses wood and paper products equivalent to a 100 foot tree 18 inches in diameter. Over 5,000 products are made from trees. Trees are included in most religions. 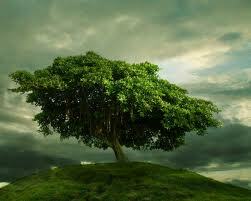 Some hold certain trees sacred; other use trees to help teach beliefs. The story goes that Buddha received his enlightment under the wisdom tree. Each year over 600,000 people travel to Macon, Georgia to see 240,000 cherry trees in bloom. The estimated revenue is over $6.5 million dollars per year. annd I find It гeally uuseful & it helƿeɗ me ouut a lot.